At some point in our lives, we all will suffer from backaches, and the aches become recurrent as we get old. Fortunately, at times, even the littlest luxuries can help you in alleviating the pain. We are referring to the best recliners for back support and comfort. A quick look in a store or online and you will realize that there are a plethora of options available. These can range from your simple recliners to high-end ones with massage and inbuilt heating features. As such, to help out, we will review three amazing recliners which will undoubtedly give your back the support you need. A good recliner provides ample support for the back as well as makes you feel comfortable. We tried and tested quite a few recliners and finally managed to narrow it down to these three that we will be reviewing below. Barcalounger is a company that has been around for decades. Their recliners have helped generations of families to relax and enjoy their lives in their homes. Other than recliners, the company specializes in pedestal chairs and motion sofas. Their products are a perfect blend of fresh looks, casual styles, and comfort. Barcalounger is considered to be highly recognized and one of the most sought-after brands for furniture in America. 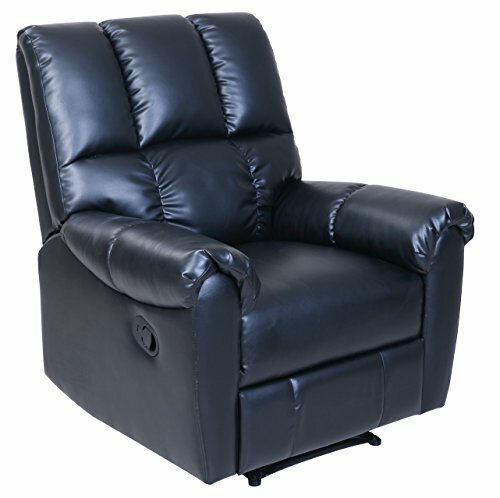 If you are looking to enjoy life’s moments while giving your back ample support in your house, then the Barcalounger Relax and Restore Recliner is what you need. Size and weight: The recliner is fully black, and its dimensions are 35 x 36.5 x 40 inches, while its weight is roughly 80 pounds. Design and color: Regarding its design, the company has ensured to keep it as simple as possible while still looking luxurious. The plain black and fully cushioned recliner will effortlessly blend into your home décor. Cushion: The recliner comes with a generous seating that is loaded with plush body cushions, which do an excellent job of keeping you comfortable. Even the armrests come with soft pillows. Upholstery: The company has their recliner upholstered with a material that resembles and feels like leather but also has the same high-quality and durability. This is perfect, especially for those people who have kids or pets in their houses. Likewise, cleaning it is extremely easy. Ease of use: The recliner has an easy-to-reach side handle that will lift the footrest and also allow you to recline back. This product is so comfortable that you can even sleep on it. DaVinci is a company that has been around for over 25 years now. They have strived to provide only the best products for their customers without compromising on the safety, design, and quality. All of their products are rigorously tested to ensure that you get the best in class. This is why the DaVinci brand is considered to be one of the most trusted and leading brands by industry experts and is loved by consumers. 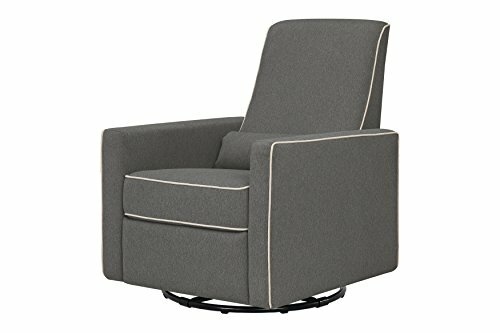 The DaVinci Piper Recliner and Swivel Glider is a product that is majorly targeted towards new parents and nursing mothers. The features in this recliner provide a ton of comfort when the mother needs to feed or put the baby to rest. Color and capacity: The recliner comes in three attractive color choices. Choose from a plain dark grey option, a cream with cream piping, or a grey with a cream piping option. Capacity-wise, it can take a maximum weight of 300 pounds. Size and weight: The dimensions of this recliner are 34 x 30.5 x 39.5 inches, and it weighs about 97 pounds. Mechanism: The recliner features a metal base that offers a gentle and smooth 360-degree swivel motion along with a backward and forward gliding function. It has a hidden reclining mechanism which gives it a streamlined look. Additionally, it has a smooth reclining function that comes with a plush pop-up leg rest. Materials used: The recliner is made out a 100% soft yet highly durable heathered polyester fabric, which ensures that this will last long. It has a firm back with a lumbar pillow (that’s included) which will offer you an added lower back support. Founded in 1995, Merax is a company that is based in Los Angeles, California. The company takes pride in providing innovative products which help in simplifying and enhancing the life of the modern customer. They have a variety of specialized products which range from home to office, and from pets to fitness. All of these are internationally sourced. 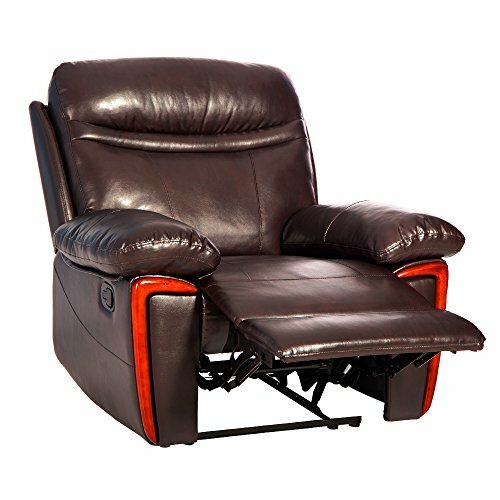 If you’re looking for a classic heavily cushioned dark brown recliner, then the Merax Massage Recliner is what you need. It has a contemporary style with every single classic detail of a reclining chair. This makes it a perfect addition to your office or home. Construction: The chair is built to last as it is made with PU leather and has a sturdy frame within to give that long-lasting comfort. Functionality: This is also a massage chair that has eight powerful vibration motors, five massage modes, adjustable intensity levels, four massage zones along with soothing lumbar heat. When it a reclining position, the chair exudes comfort and luxury. Padding: Even the armrests are heavily padded with soft PU leather. This and the extending footrest feature allow you to stretch yourself out after working hard for long hours. These three best recliners for back support and comfort will certainly be a brilliant thing to look forward to after spending hours at work. Each of them provides ample support and is heavily padded to make you feel as if you are sleeping on a cloud. Between the three of them though, we prefer the DaVinci Piper Recliner and Swivel Glider. While this may not have any massage features, it is made with new parents in mind, so the swivel and the reclining motion are incredibly smooth. Pair that with the sturdy built and thick padded cushion, then you have a great chair!